An iPad app was developed for a University in Australia. From a single campus with fewer than 400 students, the university has grown into a network of campuses, centers and partnerships around the world with more than 59,000 students from over 170 countries. The university had an immense student network and offered courses from various disciplines for the students to choose from. The university was looking to facilitate its students with the ease of confirming their class timings, lectures, courses offered etc. without any hassle. The University was looking for a solution provider to build an easy-to-access tool that would dispense university information to its students at the touch of a button. An ideal solution was to develop an iPad App to cater to all the needs the University had, the iOS App Development team at Rishabh software started work right away. Dispensing information to such a large student base through the luxury of mobile phones was a challenge. 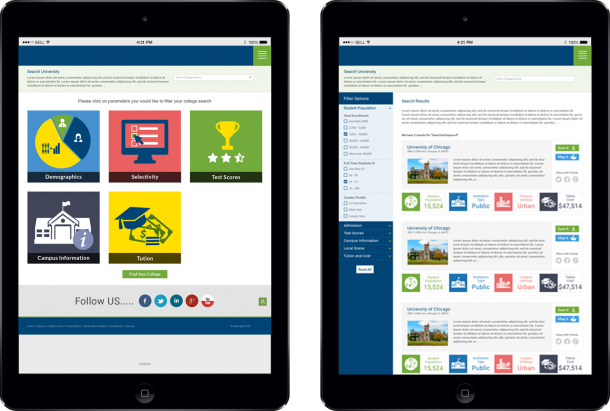 The University iPad app created by Rishabh was a cutting edge application which would enable students to search library archives, confirm class times, check grades for their work, check new courses and lectures, search for fellow students and their contact information. By having this University iPad app, the students were also able to read campus news, view campus maps etc. on the go. Let us help you develop your custom mobile application. Contact us today or call us on 1-877-RISHABH (1-877-747-4224) to know more about our iOS app development services. Click here to know more about how we can help with your Mobile Apps Development.